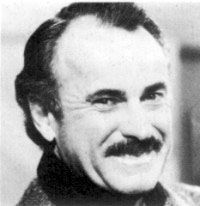 Dabney Coleman has shifty eyes and looks like a lying weasel, if only because he has played so many lying weasels in film and on TV. He was born in Austin, Texas, raised in Corpus Christi, and dropped out at both the Virginia Military Institute and the University of Texas law school before deciding to become an actor. He made his film debut in the 1965 suicide hotline melodrama The Slender Thread with Sidney Poitier and Anne Bancroft. He had small roles in many films, gradually earning "familiar faced" character actor status on the sitcom Mary Hartman, Mary Hartman, where he played the notorious father of a child preacher who eventually became mayor, and as the stuffed shirt boss in the big screen comedy 9 to 5, with Jane Fonda, Lily Tomlin, and Dolly Parton. In films, he played the easily-fooled director in Tootsie with Dustin Hoffman, and the computer expert outsmarted by Matthew Broderick in War Games. On his best remembered TV show, he played Buffalo Bill, an obnoxious and insensitive local talk show host who bristled at his co-workers Max Wright and Geena Davis. Critically acclaimed but low-rated, the show lasted barely two seasons. Coleman has a long list of other TV credits, dating back to That Girl with Marlo Thomas (he played her married neighbor). On The Guardian, he played the title character's wise but grumpy father. His other series include another soap opera spoof, Fresno with Carol Burnett, and sitcoms The Slap Maxwell Story with Susan Anspach, and Madman Of The People. Nine to Five (19-Dec-1980) · Franklin Hart, Jr.